Hi – my name is Kris Owen and I offer a reliable and friendly dog walking service in areas surrounding Bishops Stortford, Harlow Stansted and Dunmow. I have over 35 years experience with breeds of all sizes and shapes including rescue dogs with issues. Your dog will be treated and cared for as my own at all times. I can collect your dog and walk him for as long as you choose – or simply pop in to let out for toileting, feeding, medication etc . 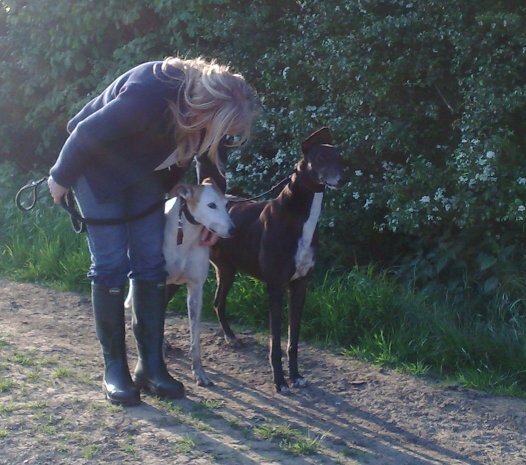 Walks will not be more than three dogs at a time and will be on lead unless you wish otherwise. The walks will be either around your area, or the dogs can be transported safely in a cage and air-conditioned vehicle to places such as Hatfield Forest or Pishiobury Park. I am fully insured for dog walking and dog care, which includes Public Liability and key cover. I can also provide safe transport from and to vets, grooming parlours, kennels etc. – or I can use one of my steady dogs to accompany yours and regularly and gently assist in their rehabilitation. Holiday cover can be arranged to avoid the need for kennels – with as many pop ins and walks as you require. I can also keep a check on your property whilst you are away. Call me to discuss rates and options available. Copyright © 2009 Herts and Essex Dog walker. All Rights Reserved.